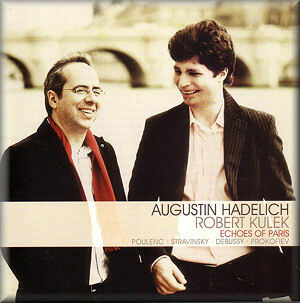 Writing in the booklet, Augustin Hadelich places much emphasis on the tragic elements displayed in Poulenc’s Sonata, and though one cannot totally disagree with this, the overall effect of the work is, to this listener, like much of that master composer’s work, one of bitter-sweetness. The first movement alternates busy, neo-classical textures with more lyrical passages, whereas the slow movement is one gorgeous melodic moment after another. There is drama in the finale, with a wistful coda preceding a curious, uncompromising ending. Composed for Ginette Neveu and in memory of Garcia Lorca, the work is highly approachable and one is not surprised to read that audiences respond enthusiastically when the violinist includes it in recitals. The performance cannot be faulted. There then follows a deliciously restrained performance of Stravinsky’s captivating Suite from 1925, a transcription of movements from Pulcinella, itself based on music by Pergolesi. This fascinating work can seem like mere pastiche at first hearing, but Stravinsky’s piquant accretions subtly transform it into something much more important and even, in its own way, rather moving. As the booklet notes remind us, the composer referred to it as “an epiphany through which my late work became possible”, and there are indeed pre-echoes of many of the composer’s neo-classical works. The performance is just right. This really is immaculate violin playing, the mood and style of the piece caught to perfection. This is perhaps the moment, too, to praise Robert Kulek’s piano playing. It is here, and throughout the recital, a remarkable display of technical ability and highly developed musical intuition. Debussy’s Sonata was his last completed work, and the third in a projected series of six sonatas for different instruments or groups of instruments. At one point during the long, grim period that was the close of his life, the composer wrote that the work was an “example of what may be produced by a sick man in time of war.” It is an elusive piece, not easy to bring off in performance. Hadelich and Kulek here give a robust, no-nonsense account of the first movement, with rather less freedom of pulse than is usually heard. The “fantasque” elements of the second movement are admirably expressed, as are the lively passages of the finale. One is struck by the scrupulous attention given to the composer’s phrasing and expression markings, very much a point in favour of this performance. There is masterly control, too, of the contrast between the more forthright passages and those wherein the music is more fragile and fragmented. It is a very fine performance indeed, then, more neo-classical in feel than many recent performances, as it is compared to older performances such as that by Kyung Wha Chung and Radu Lupu (Decca), or the marvellous Arthur Grumiaux on Philips. As with so many twentieth-century violin works, David Oistrakh was the beneficiary when Prokofiev agreed to transcribe his 1943 Flute Sonata for violin, the work becoming the Second Violin Sonata, Op. 94b. Prokofiev had long returned to Russia following his decade in Paris, and so this work has rather less connection with the French capital than the others on the disc – and thus less connection with the disc’s title; no matter, as it concludes a most satisfyingly constructed programme. The first movement alternates lyrical passages with others containing rather more acid, and there is a lovely slow movement. Both feature generous helpings of melodies in typical Prokofiev style. The second movement is a lively scherzo and the finale a military march, though with “tin soldiers” rather than real ones, according to the violinist. I think this is an astute judgement on the piece as a whole. Like much Prokofiev, it is immediately appealing, and repeated listening reveals more. It’s a big piece that works well on disc and in recital, though there’s no particularly profound statement anywhere in it. The performance is fully the equal of the others on this excellent disc, even if some interpreters have found more Russian – and less French – character in the work than these performers do. The recorded balance slightly favours the piano, but this is a matter of taste. The recording as a whole is close enough to hear the violinist’s breathing, as well as some discreet vocalising from, I imagine, the pianist. Mr. Hadelich’s booklet essay is engaging without being unduly challenging, and that, plus biographical information about the performers, appears in three languages.